Many of them were wearing black balaclavas, waving black, yellow, and white nationalist flags, and chanting, "Russians Unite!" Organizers initially expected up to 15,000 to attend the march. Moscow authorities authorized two marches - one [the Russian March] in Pererva Street in Moscow’s south-east and another in the northwest of the city. 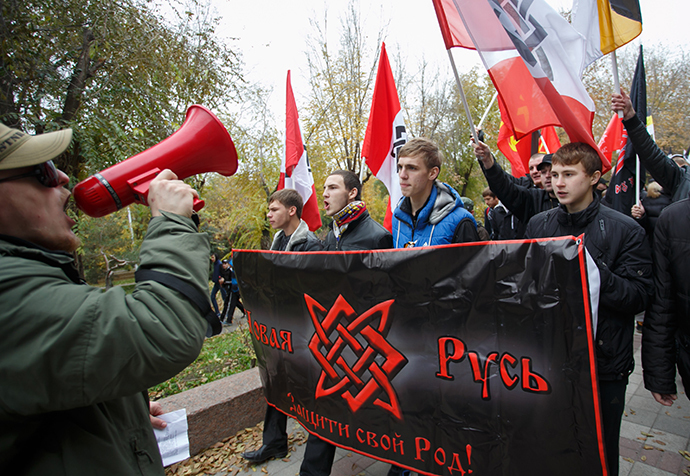 Moscow police said that the protests were peaceful and those arrested were detained for minor violations, including wearing masks, shouting out Nazi slogans and using banned symbols. Previous such marches were marked by violent attacks against migrants. 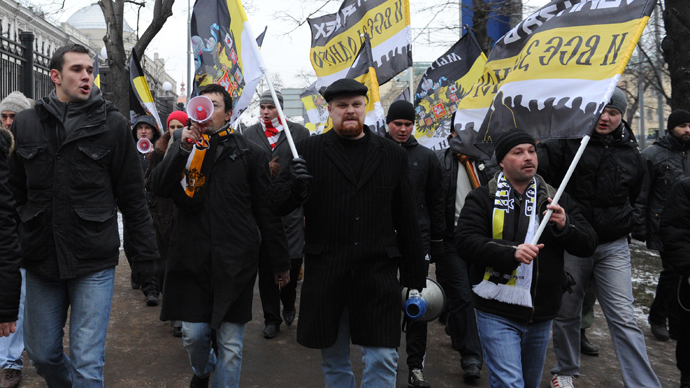 Rather small nationalist marches took place in a number of cities throughout Russia including St. Petersburg, Volgograd, Novosibirsk and Krasnoyarsk. In the city of Volgograd, central Russia, 60 people have reportedly been arrested after they tried to continue the Russian March after the allowed time. 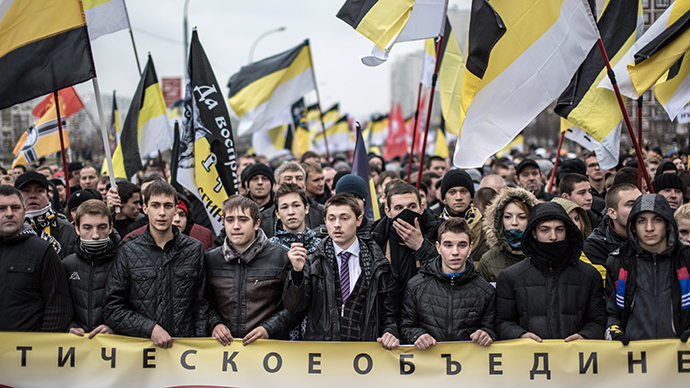 Over 30 people have been arrested in St. Petersburg, where roughly 2,000 attended the event. 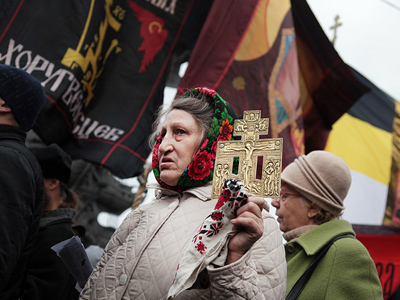 The Russian March coincides with a National Unity Day holiday President Vladimir Putin introduced in 2005 to commemorate the expulsion of Poles from Moscow in 1612. 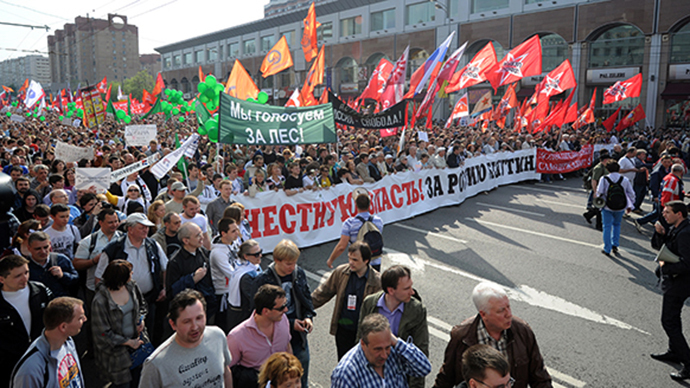 Last year some 6,000 people attended the Russian March in Moscow. National Unity Day is celebrated on November, 4 across Russia. This holiday is marked with sport events, demonstrations and public gatherings. Russia's President Vladimir Putin laid flowers at the monument commemorating the Day of Unity and 401 years since a popular force led by Kozma Minin and Dmitry Pozharsky liberated Moscow from Polish invaders.